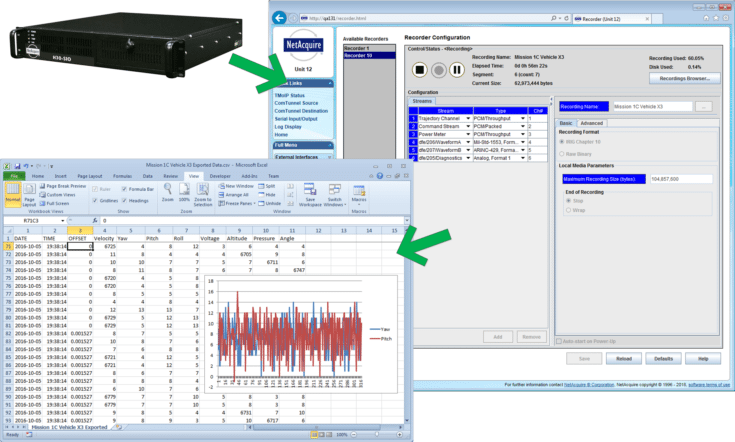 Bellevue, WA — Real Time Integration, Inc. has announced the NetAcquire AIO — a network data acquisition server-that acquires, processes, and updates real-time analog data at over 750,000 samples/second. The NetAcquire AIO uses a standard Ethernet network to communicate with a client computer monitoring and displaying the results, that may be located hundreds or thousands of feet away. The NetAcquire AIO is an ideal component for building local-area distributed test and measurement systems. The NetAcquire AIO network protocol is also Internet-compatible, allowing remote data acquisition and control from anywhere in the world. The NetAcquire AIO has been optimized as a real-time platform with an onboard 486 processor running a true real-time operating system. This allows real-time data reduction, low latency closed-loop control, and intelligent trigger scanning that cuts through unwanted data to capture critical events. Additional algorithms in some models include FFT, digital filtering, sensor linearization, PID, peak detection, and statistical functions. NetAcquire system’s industry-standard TCP/IP Ethernet network interface allows data acquisition from a wide variety of different client computers and operating systems, including Microsoft MS-DOS, Windows 3.1/95, Windows NT, and UNIX. Up to ten NetAcquire boxes can be run in parallel with each networked client computer. The NetAcquire AIO is ruggedly packaged for continuous, high-reliability operation. Advanced network error recovery and an integrated watchdog timer ensure system availability. Dynamic buffering maximizes throughput and prevents data loss. NetAcquire AIO systems are highly expandable. The basic model comes with 16 analog inputs, 2 analog outputs, and 16 digital input/outputs, and is expandable to 512 analog in, 64 analog out, and 256 digital input/outputs. Additional 486 processors can also be added to increase real-time data processing performance. Real Time Integration provides real-time distributed software, data acquisition, and communications solutions to companies worldwide. Application areas for the NetAcquire AIO include industrial process control, distributed test and measurement, and real-time simulation. The NetAcquire AIO model includes server and client software for Windows 3.1, 95, and NT. Client software drivers are available for Sun Microsystems SunOS and Solaris, and Hewlett-Packard HP-UX UNIX. For operator interfaces, optional software includes a Visual BASIC Toolkit, DAPview for Windows graphing/logging software, and DASYLab icon-based graphical interface software.